All good things come to an end. 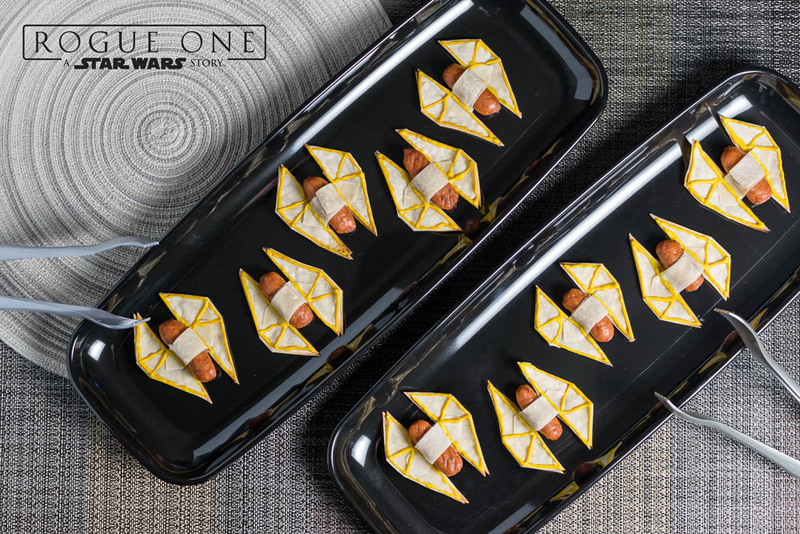 We have reached our third and final recipe of our Rogue One: A Star Wars Story trio. Fortunately, we saved the best (at least thematically) for last. Everyone knows that starfighters/vehicles are one of the coolest aspects of the Star Wars Universe. 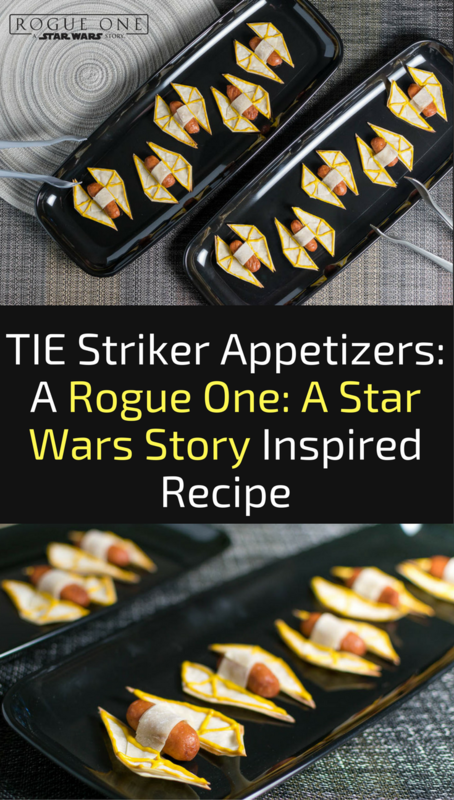 So, for our last recipe, we went all out and created our TIE Striker Appetizers. The TIE Striker is a streamlined variant of the classic TIE fighter design. It is designed for atmospheric patrols over important Imperial ground-based installations. In Rogue One: A Star Wars Story the TIE Strikers are mainly seen patrolling in the clouds along the beaches of Scarif. Since this particular starfighter was unique to Rogue One, we felt it was due a tribute. When designing the look of this recipe, we really wanted the appetizers to be mostly visual. Meaning, when you look at them they look like TIE Strikers. 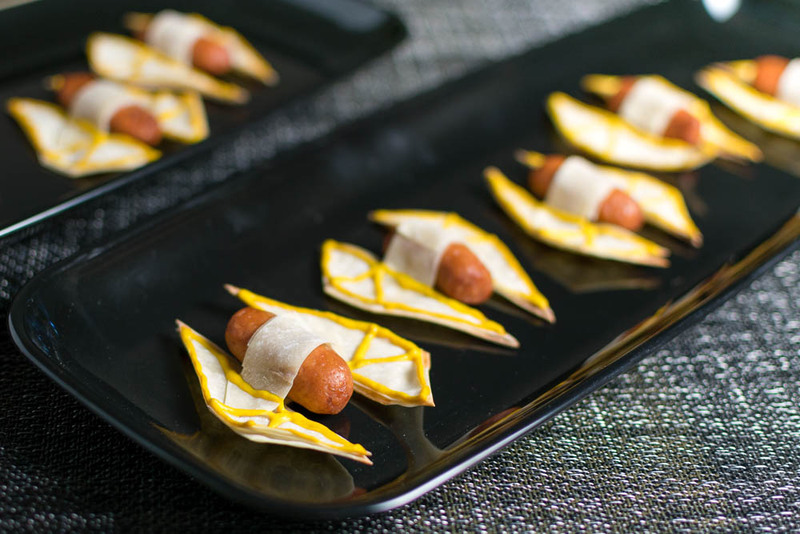 We went through a few ideas on how to achieve this but settled on wonton wrappers and Lil Smokies. The result is a sausage and cracker flavor. Even though we used mustard for the detail work, you really could use any condiment like bbq sauce or ketchup. As we mentioned earlier in the post, this is our last recipe in our Rogue One: A Star Wars Story trio of recipes. Don’t worry if you missed one as we will be re-sharing them in a recipe round-up on Tuesday along with a review of the Blu-ray! Rogue One: A Star Wars Story is now available on Digital HD and arrives on Blu-ray on April 4th. 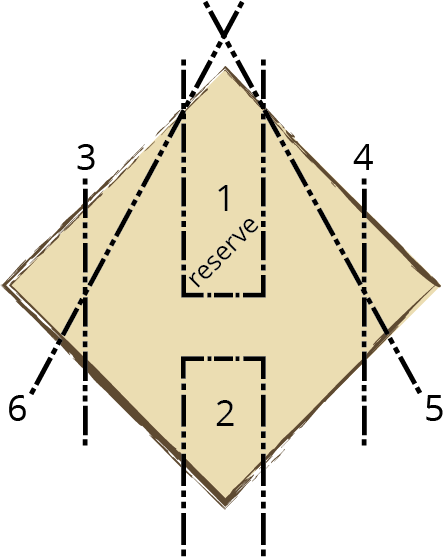 Cut wonton wrappers using the diagram as a model. Each TIE Striker will be made with 2 of the wrappers. On your foil lined baking sheet, place a wrapper, lightly moisten it with water (not too much) and top it with a seconder wrapper. Place a Lil Smokie on the double layered wrapper and using the scraps from Step One of the wrapper cuts create a "seat belt" for your Lil Smokie. Make sure to moisten the ends of "seat belt" so it will attach. Cook TIE Strikers for 5-7 minutes or until golden brown. Decorate with condiment of choice. We used a ziploc with the tip cut off to line the TIE Striker. *This is a Paid Promotion for Lucasfilm’s Rogue One: A Star Wars Story; We were also provided with an advanced copy of Rogue One for research purposes. Images and title treatments were used with permission from the Walt Disney Company. All opinions are wholly our own. View our Disclosure Policy for more info. This is such a creative use of simple ingredients, but it looks great! Such a cute fun idea. Tell them it is for the kids and we can eat it why the other adults are not looking. This is such a fun idea! My son will love this! I know someone who is going to love this- he is a true geek and loves great food! what a creative recipe I must say! hats off to your imagination!